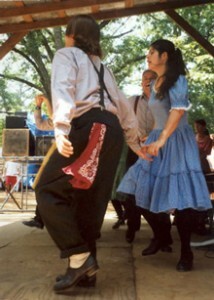 Jennifer, a native of Chapel Hill was first introduced to clogging by her third grade teacher. Some 20+ years later those basic clogging steps, learned in elementary school, helped in landing her a spot with the Apple Chill Cloggers. When she is not dancing, Jennifer builds custom, contemporary furniture for a local woodworking shop.